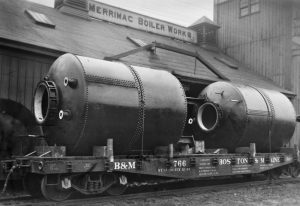 The rich history of Helfrich Brothers Boiler Works began when two brothers, Vin Helfrich, Sr. and Joe Helfrich, worked at Merrimack Boiler Works upon their return from World War II, where they served their country as pilots. Located on the banks of the Merrimack River, Merrimack Boiler Works was a staple in Lawrence, Mass. from 1843 until they closed their doors for good in the mid-20th century. Vin and Joe seized the opportunity and purchased the Merrimack Boiler Works building on the Merrimack and established Helfrich Brothers Boiler Works (HBBW) in 1948. Growth followed quickly. In 1960, Helfrich Brothers began to serve industrial, municipal, and institutional markets with aftermarket powerhouse products and services. Helfrich Brothers soon secured their certifications and became a full-service boiler contractor, furnishing and installing replacement boiler parts and plant components, as well as providing emergency repairs. The story continued until 1985 when the second generation of Helfrich brothers assumed ownership of the company. Also named Vin and Joe, they expanded the business and began to serve industrial, utility, pulp and paper, and waste to energy markets. By 1995, Helfrich Brothers decided it was time to expand on the original Merrimack Boiler Works building that was purchased back in 1948. They built two new shop facilities: a tube and header fabrication shop and a tank and large vessel fabrication shop, both equaling about 95,000 square feet. With new technology, such as state-of-the-art spiral weld overlay lines and 20,000 sq. ft. heavy-lifting bay expansion with 50-ton crane capacity, Helfrich Brothers quickly established itself as a distinctive player in the industry. Helfrich Brothers continues to grow, consistently re-establishing itself as a quality, single-source turnkey supplier of products and services within the energy market.